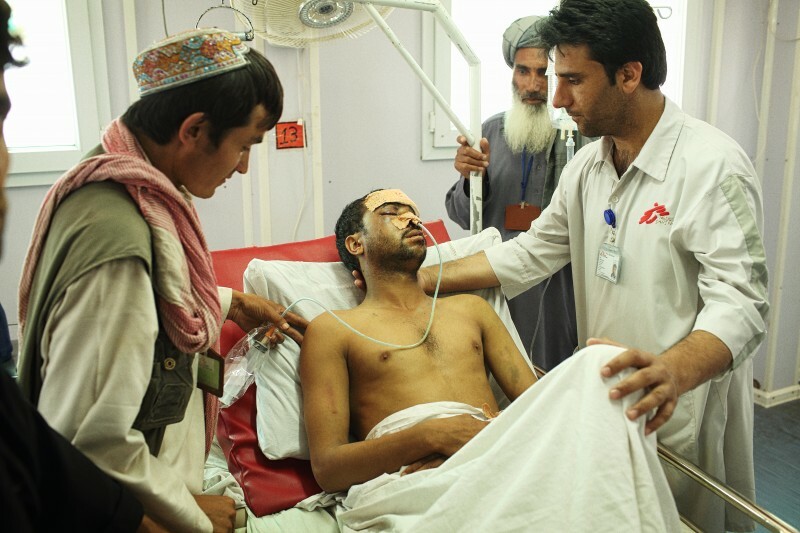 A man injured in a traffic accident is treated at Médecins Sans Frontières (MSF) Kunduz Trauma Centre. Andrew Quilty/Oculi. Permission to use. This article was collated by Global Voices using material provided by Médecins Sans Frontières (MSF). MSF is an international, independent, medical humanitarian organisation that delivers emergency aid to people affected by armed conflict, epidemics, natural disasters and exclusion from healthcare. It works actively in over 70 countries across the world. 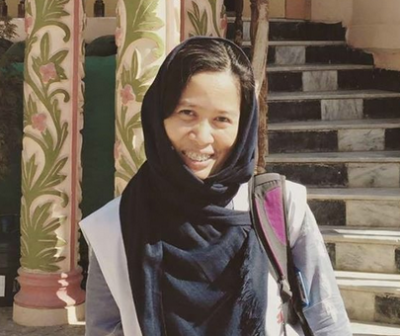 The accounts below come from Dr. Evangeline Cua, a surgeon from the Philippines who worked in MSF's Kunduz Trauma Centre in Afghanistan. Dr. Cua was on duty when U.S. airstrikes destroyed the centre on October 3. This article marks the six-month anniversary of the event. Dr. Evangeline Cua of MSF. Photo by MSF. Fire licked at the roof at one end of the building, dancing and sparkling in the dark, reaching towards the branches of the trees nearby. The ICU was burning. Outside, only the constant humming from above pointed to the presence of something. An aircraft? Airstrike? Why the hospital? Why us? Then, without warning, another tremendous, earsplitting blast shook the building. The ceiling came crashing down on us and the last remaining lights were turned off, sending us to total darkness. I screamed in terror as wires pinned me to the ground. That was the last thing I could remember. I woke up sobbing and disoriented. It had been months since I went home from Afghanistan and, except for a fading scar on my right knee, that awful incident at the Kunduz Trauma Center was almost forgotten, suppressed to memory. Debriefings, consults with psychiatrists, meditation techniques, pages upon pages of journal entries to unload myself of the horror of that night….all of these were swept aside when memories came rushing in a nightmare triggered by a firework. Dr. Cua's MSF mission in Kunduz had been a largely uneventful one prior to an intensification of fighting between government and Taliban troops that led to the latter briefly capturing and holding the strategic northern city in late September of last year. That unleashed a crescendo of violence that led to U.S warplanes dropping a bomb on the facility where she worked in one of the worst single incidents of civilian casualties in the 14-year history of the Washington-led war in the country. A total of 42 people died in the airstrike, which the United States government called an “avoidable mistake”. The hospital played an important role in the city, providing free medical care for anyone in need. Below, Dr. Cua recalls how on the day of the strike the hospital was overwhelmed, working around the clock to save residents of the region caught in the crossfire of the Taliban-government conflict. At least 24 of those patients would be killed by what MSF terms “precise and repeated U.S. airstrikes” that day, along with 14 MSF staff and 4 caretakers. MSF considers what happened next a war crime, as the fully functioning hospital was protected under International Humanitarian Law. Shortly after the mistaken bombardment of the hospital began, MSF sent a signal to the United States government informing it that its facility was under aerial attack. The fact that the AC-130 gunship conducting the strike confused the hospital with a building where Taliban forces were believed to be camped out is no consolation for the families of both victims and survivors of the tragedy. We noticed fire darting in and out of the windows just above where we were hiding. Without any hesitation, he hoisted himself up the wall and successfully jumped out of that pit and ran into the open. I was left in the dark . . . alone. I was also afraid. I don't want to be burned alive. The tears came in a torrent, bringing all my frustrations to surface. Six months after the airstrike, there is no functioning hospital to replace the five-year-old facility in Kunduz that was the only one of its kind in Afghanistan's entire northeast. MSF has not yet made a decision about re-opening the trauma hospital in the city. We first need to obtain clear reassurances from all parties to the conflict that our staff, patients and medical facilities will be safe from attack. We require assurances that we can work according to our core principles and to international humanitarian law: namely, that we can safely treat all people in need, no matter who they are, or for which side they may fight. Our ability to operate hospitals on the frontline in Afghanistan and in conflict zones everywhere depends on the reaffirmation of these fundamental principles. In the spirit of our community's dedication to the protection of universal human rights, Global Voices worked with MSF to produce this edited version of Dr. Cua's testimony and MSF's statements about the airstrikes and their long-term impact for the people of Kunduz.